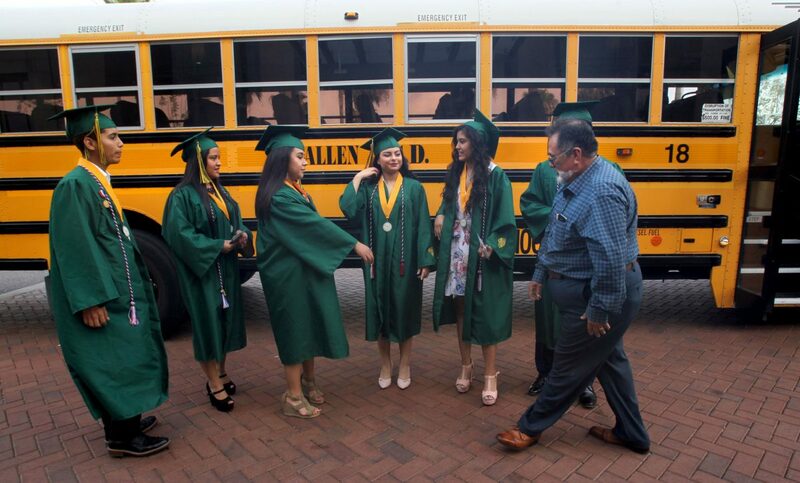 As Nikki Rowe High School graduating seniors filed into the McAllen Convention Center on Friday, McAllen ISD bus driver David Gomez walked out the door with a group of students. They headed to a waiting school bus parked on the curb. Seniors of bus route 18 donned green caps and gowns while posing for pictures in front of the yellow vehicle with their now-former driver. Gomez garnered attention on social media after images of congratulations cards, each stuffed with $20, went viral. Their story was featured on both KRGV-TV and KGBT-TV this week. 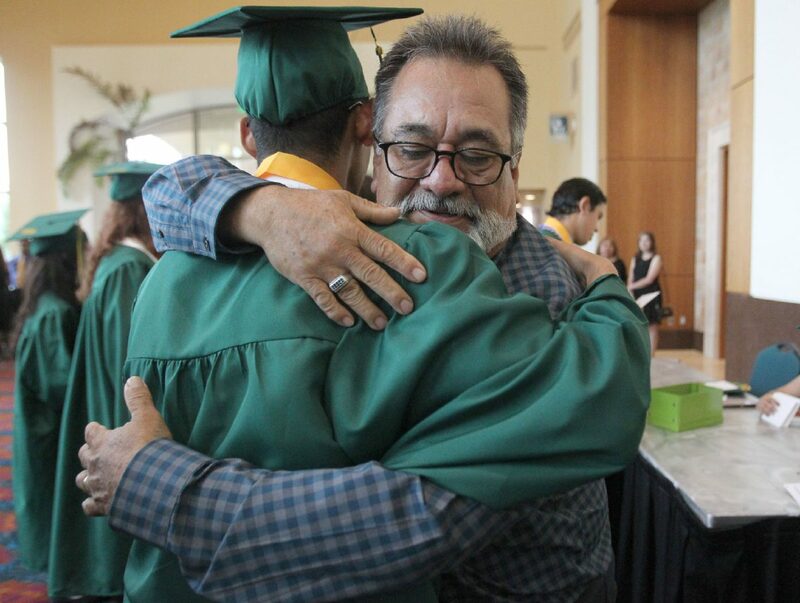 David Gomez, a McAllen school bus driver, hugs one of his students who rode his bus throughout the four years he drove for McAllen ISD Friday, June 01, 2018 at the McAllen Convention Center . Gomez handed out $20 and congratulatory cards to 11 McAllen Nikki Rowe seniors. Gomez said the gesture wasn’t meant for attention but as “a little push” to let them know he has their backs. Laetia Cantu, a graduating senior, said she couldn’t help but get emotional from Gomez’s gift. For the last four years, Gomez has offered McAllen students words of encouragement and concern, according to multiple bus riders. If a rider is happy, sad or tired, Gomez paid attention and was a cheerleader reminding kids to do their best. Graduating senior Alondra Hernandez remembers Gomez making her feel welcomed when she started riding her sophomore year. Gomez has a theory why his story was popular on social media. The bus driver said his parents divorced when he was young, but he was lucky to have a stable network of support. He knows some of his riders might not be so fortunate. And his compassion seems to be contagious with his riders. And this is the sentiment Gomez hopes will spread beyond the bus. “The most valuable part of this story that went viral … (is) to be better to other people, not only with your close family (but) any people you see on the street or your neighbors,” he said. “We need to be better.